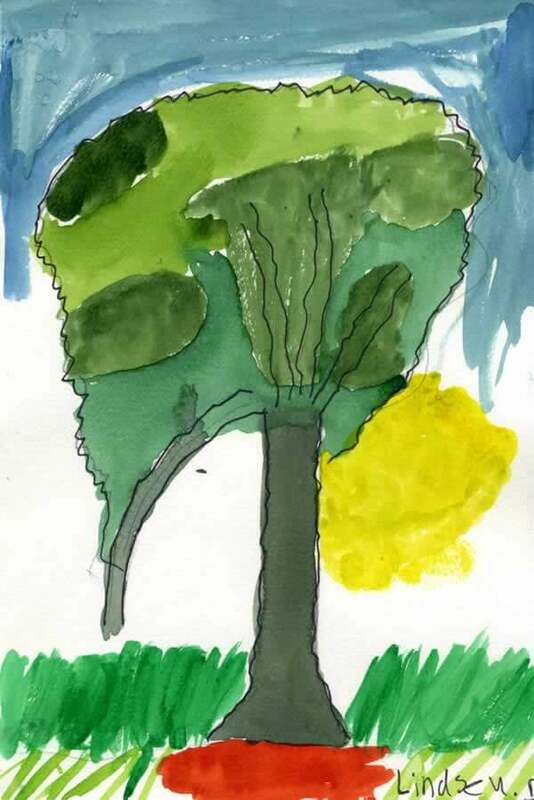 Children spend time observing and painting their trees, with a focus on looking closely at colors and structures and learning to work attentively in nature. 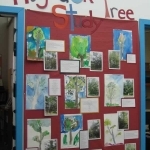 Students will draw and paint their tree based on direct observation. 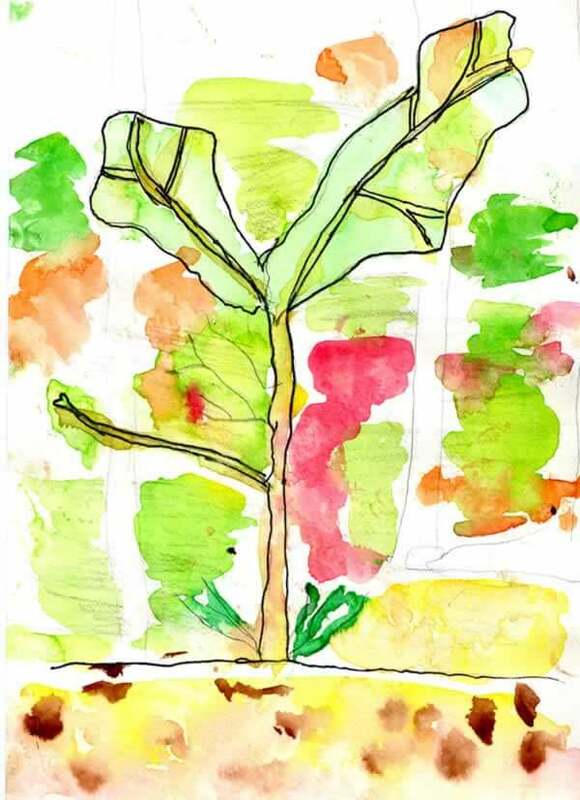 Students will mix watercolors to create colors they see in nature. Students will spend time in close proximity to their tree, getting to know the tree and its surroundings. 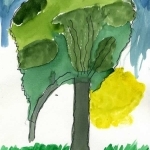 See Adopt a Tree: First Visit for introductory activities that precede watercolor painting, including choosing a tree, sketching and journal writing. Step 1. Outdoors at Adopt-a-Tree Site. Gather class in a circle at the site and explain the schedule and expectations for the day’s visit. 5 minutes. Step 2. 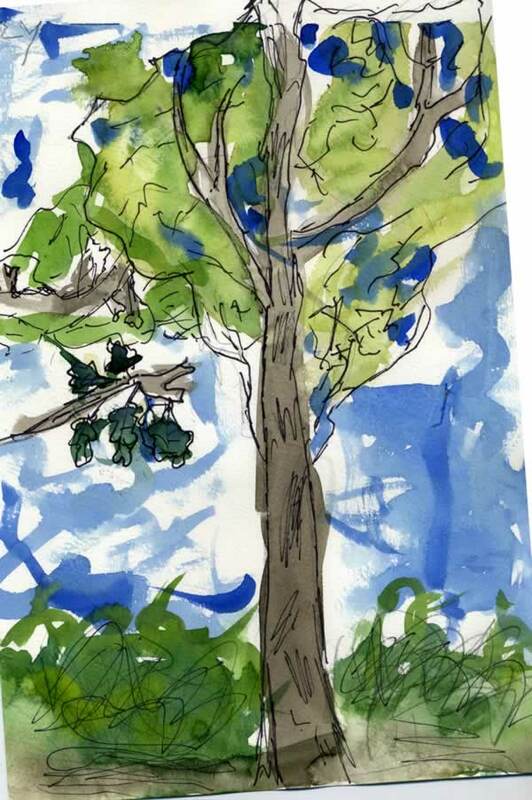 Demonstrate how to make a watercolor painting of a tree, showing and discussing each step, using a tree close by that everyone can see as a model. 20 minutes. Use PENCIL to draw the ground first. Teacher holds the paper vertically, so children can see, and draws a horizontal line near the bottom of the page, modeling how she draws the ground as she sees it. Use PENCIL to make marks for the top left corner and the top right corner of the tree’s branches. This will help you fit the tree on the page. Use PENCIL to draw the main branches. Start with the biggest branches you can see. Teacher uses the model tree as an example, asking students which branches they might draw first and drawing as they point. Use black SHARPIE PEN (fine point felt tip) to trace over the pencil lines. Pen makes a line that will show through watercolor paint. Press lightly with the pen and be sure to lift the pen off the paper when you pause so it does not pool up. Use WATERCOLOR PAINT to mix colors for the tree parts. Teacher shows how to dip brush in water, then into paint, cleaning the brush with water between colors. Teacher mixes paint in the lid until it “looks right.” Students discuss different greens and teacher demonstrates how to mix them. Step 3. 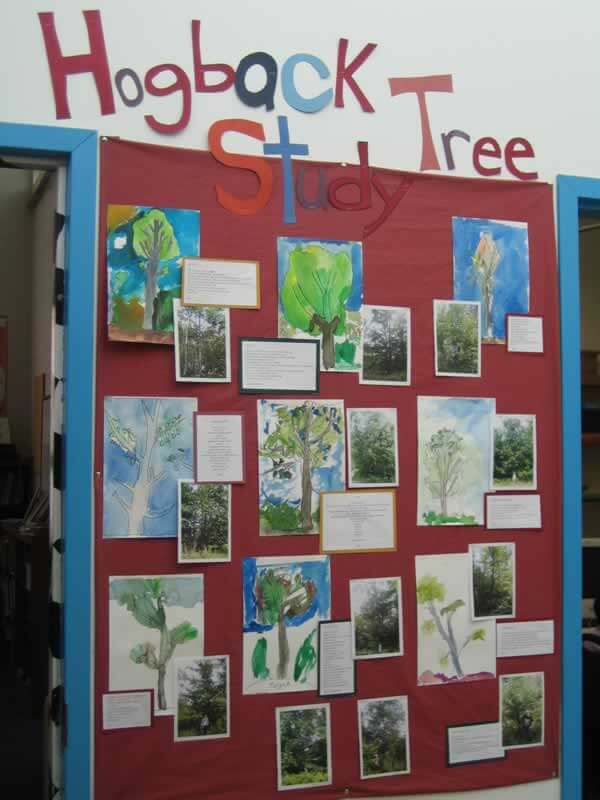 Students go to their adopted trees and work through the steps of pencil drawing, pen drawing and watercolor painting. 40 minutes. Teacher may ask to see each child’s pencil and pen drawing before handing out watercolor paints. Teacher circulates, reminding children of steps and discussing what they see in terms of colors, shapes of branches, etc. Children exhibit watercolor paintings on a bulletin board. Optionally, you may exhibit photographs, poems, and/or tree journals alongside paintings. 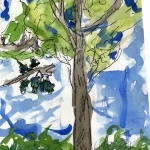 Scan paintings to create on-line gallery of tree paintings for class website. 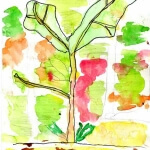 This lesson is part of the Adopt a Tree sequence, which begins with Adopt a Tree: First Visit. See also Adopt a Tree: Poetry Writing. This class did the poetry and painting activities on the same day: they divided the group in half and switched activities after an hour and a half, with lunch and outdoor games between activities. 1: Classify plants and animals according to the physical characteristics that they share. 2: Identify the structures in plants (leaves, roots, flowers, stem, bark, wood) that are responsible for food production, support, water transport, reproduction, growth, and protection. 2.1: For color, explore and experiment with the use of color in dry and wet media. 2.2: For line, explore the use of line in 2D and 3D works. Identify a wide variety of types of lines in the environment and in artwork. 3.1: Create 2D and 3D artwork from direct observation.